Today is 8th March and the whole world is celebrating OUR day---That's WOMEN'S DAY. Happy Women's Day to ALL. Its meant to appreciate, respect all the famous and silent achievements of womanhood. Celebrating this Day with a Traditional Mughlai dish - Channa Dal Halwa. I joined this group called South vs North Challenge just few days back after having a virtual tour of delicious, mouth watering dishes from other food bloggers. The event is successfully hosted by Divya from You Too Can Cook - Indian Recipes. Its a great way to learn dishes from different regions and SNC is gaining its popularity day by day. To know more about this event, visit Divya's space here. I actually tried SNC -5 challenge of Green Peas Kachori with Dum Aloo yesterday and it became an instant hit at home. Will post the recipe soon. This Month's Challenge is from Kirti of SNC- Northern Group. She challenged the Southern Group with this delicious Channa Dal Halwa/ Burfi. This dish is a Mughlai dish from her mom. Thanks Kirti for this recipe. 1. Wash and soak Channa Dal for 3-4 hours. 2. Cook it in a pressure cooker with little water for 2 whistle. 3. Remove extra water and cool them. 4. Mash it with a spoon to form a coarse mixture. 5. Heat Ghee in a heavy bottomed pan and add this mashed Channa Dal mixture to it. Fry this on medium heat till ghee starts to separate. 6. Pour 1/4 cup milk to this and mix. Stir again on a medium heat till the mixture gets dry. 7. Repeat the above step (N0.6) till all the milk is used. 8. Now add jaggery and mix it. Keep stirring till the mixture gets dry and you notice ghee separating from the edges. 9. Add Cardamom powder and mix. 10. Serve it in a serving bowl topped with some grated dry coconut or chopped almonds. You can also spread them on a greased plate and cut it into barfi's and serve. 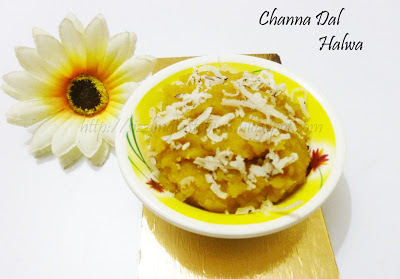 Makes 2 bowls of Channa Dal Halwa. Linking this to Kirti's Space. Loved this yummy halwa. Super delicious. Halwa looks very delicious. You have a yummy blog...happy to follow you! 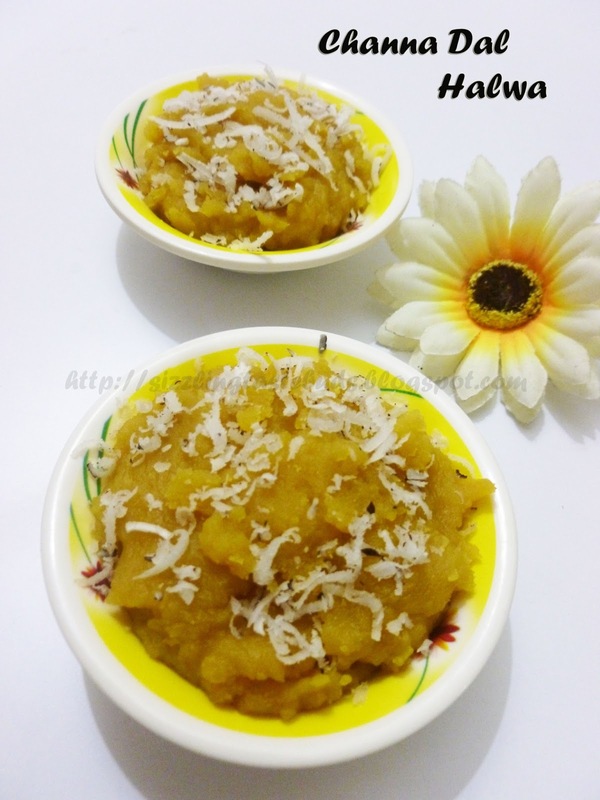 Halwa looks delicious.. love the fact that you have replaced jaggery for sugar.. Very nice! !